In 2003, George Mason University President Alan Merten and Helen Ackerman, Vice President for University Relations and a George Mason alumna, had decided that it was time for Mason to create new institutional logo for both the University and its athletic teams. The then-current logo had been designed in 1982. Ackerman explained, “We want people to know what a distinct place George Mason is…Creating a visual that people will recognize is one way to do that.” The branding initiative was a task that neither took lightly, given the failed attempts Merten had seen at other universities with which he had been involved and the great amount of work it entailed for Vice President Ackerman. Ackerman formed two committees: one to work on the university logo, which was more historical in nature (reminiscent of the university seal rather than a logo, according to Dr. Merten), and one to work on the athletic logo, which Dr. Merten “despised [because] it didn’t even have our name on it.” Students and faculty members were active on both committees, and Ackerman also decided to hire a consultant—the company Grafik was chosen, and it examined competitor’s logos, conducted interviews, and took a campus tour. Ackerman’s hope was that the new logo would “reflect the dynamic environment of a school committed to the kind of educational excellence found at the best traditional universities while also being committed to maintaining an extraordinary culture of innovation and diversity.” The embracing of the design by the University and the national recognition of George Mason following the Final Four appearance confirm that vision. 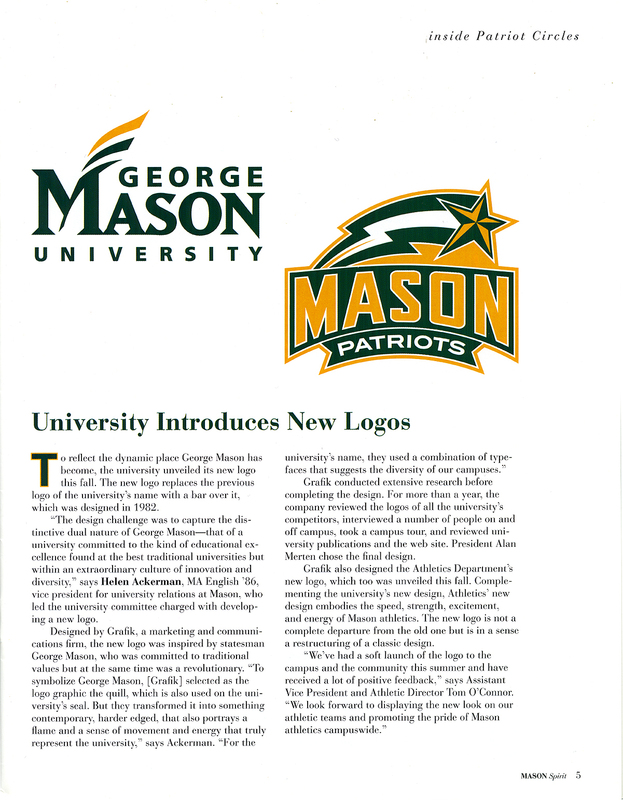 Browse items pertaining to George Mason logos.